0114_met_mbceremony9: Singles: News-Editorial: Award-Winning Evansville Photographer: Molly Bartels specializing in editorial, wedding and art photography in Evansville, Indiana. 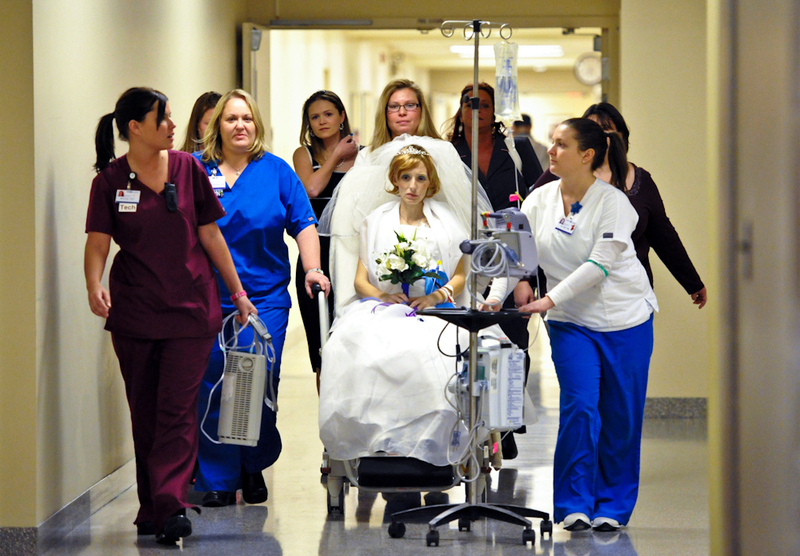 Jessica Wirth is tended to by the St. Mary's Medical Center staff as she makes her way to the chapel for a commitment ceremony to Daniel Lawrence, her partner of seven years, at St. Mary's Medical Center in Evansville on Thursday, January 13, 2011. Wirth had surgery on Wednesday and has advanced gastric cancer. With the help of family, friends and the staff at St. Mary's, the ceremony was put together in under twenty-four hours. Only two days later on Saturday January, 15, 2011, Jessica passed away at 7:35 p.m. surrounded by her family and friends. The couple has a son, Colton, 18 months.